This is the largest of the herons in North America. 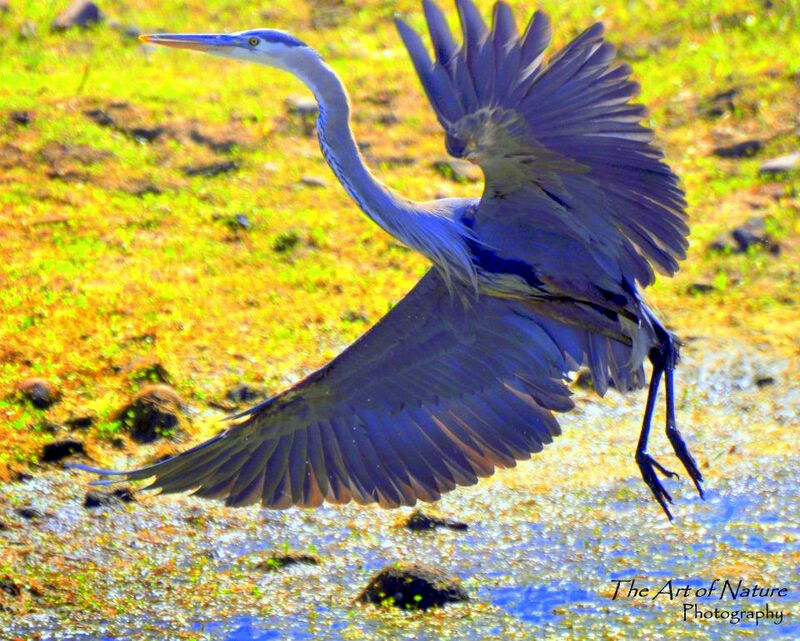 With its long legs, long sinuous neck curled into an s-shape and a yellow bill like a dagger, the great blue heron is a formidable sight. They are 50 to 54 inches long from beak to tail. The long plumes on the head, chest and wings give them a shaggy appearance. They are blue gray in color, with a black stripe and black plume on the head just over the eyes. The wing has two tones of blue with the lighter color on the forewing and darker blue on the flight feathers. Blue heron has a varied and adaptable diet. Though fish are the primary dinner dish, they also eat salamanders, frogs, snakes, insects, rodents, birds and even stalk gophers and voles in the fields. They breed in colonies, mostly with their own species, but sometimes mixed with other wading birds. The male chooses the nest site. He displays to attract a female by stretching his neck up pointing his bill towards the sky. Sometimes he will also circle above the nest colony stretching his neck again and erecting his neck feathers. The heron nest is high in the trees, usually 20 to 60 feet above ground or water. If the area is predator free, the nest may be in low shrubs or even on the ground. Though the male chooses the nest site, the female builds the nest with the material he has gathered. The nest will be very large and built as a platform of mostly sticks and lined with pine needles, moss, and dry grass. It may take up to two weeks to complete the nest. They are colony nesters and colonies may contain as many as 500 nests. Blue Herons lay between 3 to 5 eggs and both incubate the eggs for 25 to 30 days. The first chick has the most experience in handling food and aggressively takes food from the parents to grow more quickly than younger chicks. Since parents feed the young by regurgitation, the parents eat up to four times more food when tending young checks than when incubating. It takes 60 days before the young can fly and are ready to leave the nest. Fledging usually occurs between 65 and 90 days after hatching. The fledglings return to the nest for the next three weeks and then gradually disperse over the winter. Great Blue Herons have been spotted alongside the Mokelumne River Bridge, in Ione, and around Lake Camanche. They are found along both fresh and saltwater habitats, around marshes, riverbanks, sloughs, and even near backyard goldfish ponds.